I've never seen a Windows PC boot faster than HP's versatile Spectre X360 hybrid, which has a start time of four seconds. HP's Spectre X360 is designed to be used mainly as a laptop, but can turn into a tablet flipping the screen backwards. During a hands on test, it didn't feel like the lightest or thinnest hybrid, but it performed admirably and had a generous feature set. The hybrid will ship worldwide in March starting at US$899. I tested a unit with Windows 8.1, an Intel Broadwell Core i5 processor, 256GB of solid-state drive storage, 8GB of memory and a full high-definition touch screen, which would retail for around $999. 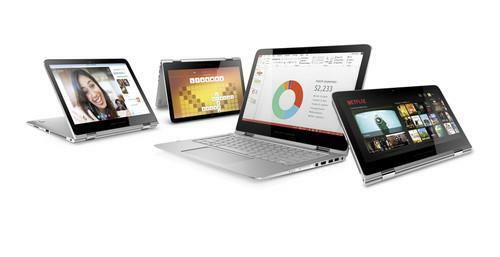 The prices of different models are comparable to Lenovo's Yoga, which has a similar hybrid design. At roughly 1.5 kilograms, the HP hybrid isn't as light as Dell's 1-kilogram XPS 13 laptop, which has the same screen size, but a thinner frame. The Spectre X360 is 15.9 millimeters thick in both tablet and laptop modes, a tad more than Lenovo's Yoga. The hybrid has a metal finish, like in the company's Envy and EliteBook laptops, giving it a solid build. It has a well-placed keyboard, but a larger-than-normal touchpad limits the space on which the palms can be placed when typing. The X360 is a move away from the most recent Spectre hybrid, whose screen can be detached. HP opted to glue the screen and keyboard together in the Spectre X360 due to the need for a larger battery and high-performance processor, which are located on a motherboard underneath the keyboard. Detachable hybrids, which typically house all components behind the screen, can be slower due to limitations on the type of processor, memory, storage and cooling techniques used. The Spectre X360 has a 56-watt hour battery that last around 11 hours when watching 1080p video, according to HP's benchmarks. That falls to around nine hours when watching Netflix using Wi-Fi. Battery life in Broadwell-based laptops has been going up, with Dell claiming 15 hours of battery life with its XPS 13 and a Panasonic Toughbook exceeding twenty hours on two batteries. The hybrid's boot time of four seconds was much faster than HP's estimate of eight to ten seconds. I was in for another surprise when it shut down in just one second, which is faster than most tablets and smartphones. Applications in Windows 8.1 also loaded quickly. The boot time could be longer on entry-level models with just 4GB of RAM. The glossy screen displayed sharp images, but reflections bounced off when a source of light hit it directly. The hybrid has three USB 3.0 ports, a DisplayPort 1.2 port, and an HDMI slot. It's possible to attach two monitors to the hybrid, said Mike Nash, vice president of product management for consumer personal systems. A number of hardware and software features have helped crank up the hybrid's performance. HP has put in unique Wi-Fi 802.11ac antennas, sensors and other hardware specific to this hybrid, and had to work with Microsoft to create a customized Windows 8.1 OS image, he said. Sensors tell the operating system which mode the hybrid is in -- tablet or laptop -- and Windows can adjust the power and performance specifications accordingly. The hybrid will also be ready for Windows 10 when the OS is released later this year. Windows 10 is more sophisticated in analyzing sensor data and adapting the OS to different usage models, Nash said. An appealing feature in Windows 10 is the ability to automatically switch between tablet and desktop user interfaces depending on the position of a device. The hinge on Spectre X360 has a sensor that could feed data to Windows 10 to let the OS determine if the hybrid is in tablet or laptop mode. The Spectre X360 won't win beauty awards, but it's a solid performer. If the idea of a hybrid with a non-detachable screen appeals to you, it could be worth looking into. The company later this year will ship a model of the hybrid with a 2560 x 1440-pixel resolution. The most expensive unit with a Core i7 chip, 8GB of memory and 512GB of SSD storage will be priced at $1,399.